Blacked out engine with highlighted cylinder head cooling fins. 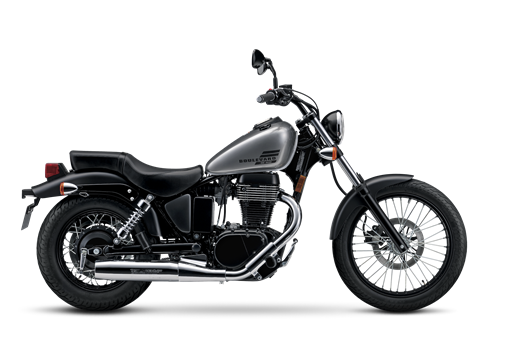 Blacked out handlebars, upper fork clamp, headlight shell and other components deliver a bold, custom look. The 652cc, SOHC, single cylinder, air-cooled, four-stroke engine with TSCC (Twin Swirl Combustion Chambers) cylinder head and high mass crankshaft produces strong low-end power and torque. Sculpted engine features a rich, blacked out treatment with a large, visually striking cylinder and head with highlighted cooling fins. Attractive teardrop-shaped fuel tank (2.8-galllon capacity) with flush-mounted speedometer. One-piece saddle adds to streamlined appearance. The deeply cushioned seat has a low 27.6-inch seat height that’s great for smaller or entry-level riders. A wide 15-inch rear tire and slim 19-inch front tire provide a classic cruiser look. Lightweight (381 pounds) for easy maneuverability. Convenient hazard and passing-light switches.